You are currently browsing the tag archive for the ‘dove’ tag. A really quick post today: here are two interesting flags from Taiwan. Above is the flag of the Taiwanese police and below is the flag of the Taiwanese Coast Guard. Since these agencies are charges with keeping the peace, the emblem on their logos is a pigeon/dove. Although the bird’s official police styling gives it an authoritative edge, I like the fact that it is still a dove. In America, as you might imagine, the police have stars and eagles on their flags/logos/devices (although I guess there are suns and a dragon in the mix in these Taiwanese flags). I wonder what the Taiwanese police badge looks like? Last week’s post concerning the ancient Greek oracle of Zeus at Dodona made me curious whether there are any black pigeons or doves (for, according to myth, the first oracle at Dodona was a black talking dove which flew from Thebes). This is a black Indian fantail pigeon, and while there are no indications that the bird can talk it is a gorgeous animal. Look at how selective breeding has given the domesticated fantail a beautiful peacock spread of black feathers and silky ornate foot feathers! After yesterday’s soul-searching, let’s take a moment to rest and renew our spirits…with a beautiful bright orange-gold dove from Fiji. This is the orange fruit dove (Ptilinopus victor) also known as the flame dove—a lovely small short-tailed dove which lives in the paradisiacal rainforests of Fiji where it eats an omnivorous diet of fruit, larvae, insects, and small arthropods and mollusks. The male birds (pictured here) have bright orange body feathers and shiny olive green heads (AND blue green legs, skin. and beaks). The females are olive colored and don’t call so much attention to themselves. I wonder what it would be like if, through some bizarre fluke, rock pigeons (aka pigeons) only lived on a few small islands in Fiji and the orange fruit dove was found in cities everywhere. Would we be oohing and ahing at the rock pigeons subtle grays with iridescent sheen and dismissively wave off the flame pigeons gorgeous orange as vulgar? It is Easter week. To celebrate, Ferrebeekeeper always features some of the astonishingly beautiful artworks of Jesus Christ from Western art. Look for that tomorrow! Before we get there, however, let’s take a moment to enjoy spring with some dove-themed kites. I love kite-flying and I have been thinking about building a hand-made kite which reflects one of Ferrebeekeeper’s themes (you can see them all over there in the menu in the left). As I have looked up other people’s kite-making ideas I have found some really beautiful art for the sky—like these dove kites. Here are the lovely white dove-themed kites which I thought were especially fine. There is even a simple design, if you want to make your own with a sheet of paper and a straw…yet sadly I did not find any pigeon kites. I wonder why these omnipresent birds are so poorly represented. Happy Valentine’s Day! The three traditional symbols of this holiday are (1) a voluptuous heart-shape, (2) Cupid, and (3) a pair of doves. The first of these—the shapely heart–is a medieval symbol, but the other two holiday symbols are much older and trace their way back to the ancient Greco-Roman world. The mischievous archer Cupid was the god of infatuation and besottment—with his phallic arrow, he is so ouvert that he is barely a symbol. In the world of Christian iconography, doves represent peace, divine revelation, and the holy spirit, however in the classical world they were the bird of Aprodite/Venus. Valentine’s Day is really Lupercalia—the fertility festival to Lupercus (Pan). In the modern world it (barely) masquerades as an acceptable holiday, but its wild roots are never far away. I get the sense these doves are really the amorous doves of Venus and not representations of peace. To celebrate, here are some Valentine’s doves from Valentines throughout the ages. Doves pulled the chariot of Venus and they nearly always attended to her. Their tenderness with each other and their ability to rapidly proliferate made them abiding symbols of love. Additionally, doves are uniquely beautiful and otherworldly and yet also commonplace. They can fly to the heights of heaven and yet consist on meager scraps in wastelands. Maybe doves really are a good symbol of love! Ferrebeekeeper has long served Athena, the virgin goddess of truth and wisdom (although she is never the most popular goddess, she is certainly the BEST and is always is victorious in the end), and, in my time, I have also served Dionysus. All American are compelled to serve Hera for 8 hours every workday (except the super-rich, who serve her constantly). Yet Aphrodite has almost always eluded me. Springs come and go and the long decades pass, but love is elusive. Maybe some sacred doves will please coy Aphrodite. In the meantime, Happy Valentine’s Day to everyone. I hope you find the love you are looking for in your life. Or at least I hope you enjoy these doves and maybe some chocolate! This artist needs no introduction. 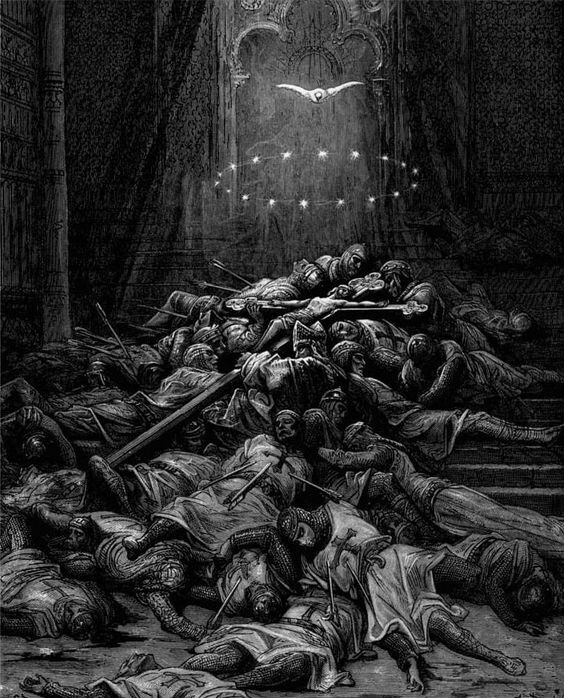 Gustave Doré was the preeminent illustrator of the 19th century. Although he became rich and successful, he was a workaholic, who took joy in his work rather than riches. He never married and lived with his mother until he died unexpectedly of a brief severe illness. 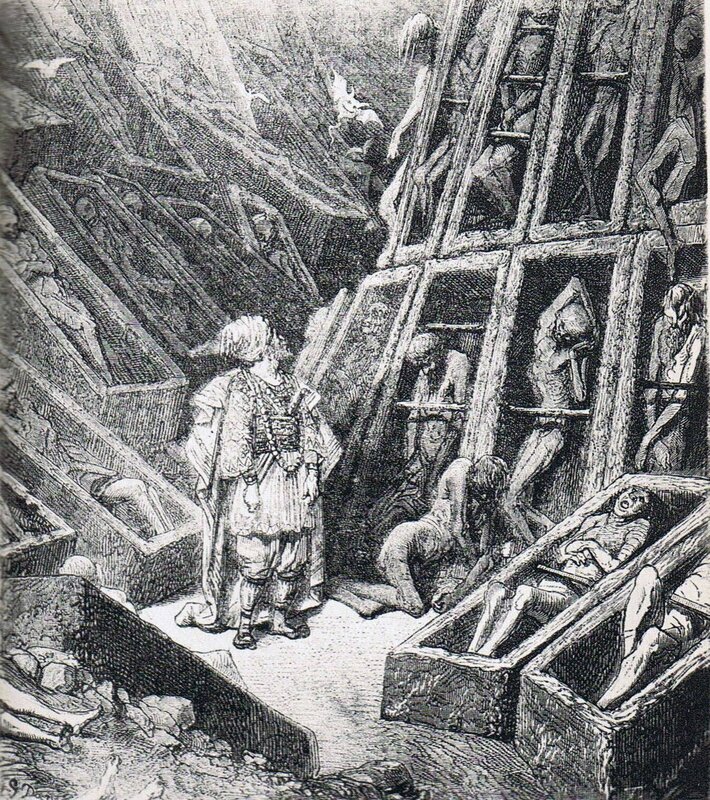 Doré illustrated everything from the Bible, to Nursery Rhymes, to Dante (one of my friends decided to become an artist upon looking at Doré’s version of Dante’s hell). Likewise he provided images for the great poetry and novels of his time. We could write a whole novel about Doré’s life (well we could if it wasn’t entirely spent sitting at a drafting table creating astonishing visual wonderment), but let’s concentrate instead on three especially dark images from his great oeuvre. First, at the top is an image of the end of the crusades. Every paladin and holy knight lies dead in a colossal heap. Collectively they grasp a great cross with their dead limbs as a glowing dove surrounded by a ring of stars ascends upward from the carnage. It is a powerful image of religious war–made all the more sinister by Doré’s apparent approval (and by the fact that it looks oddly like an allegory of the present state of the EU. Next we come to a picture from European fairy tales: a traveler bedecked in sumptuous raiment stands surrounded on all sides by writhing corpses trapped inside their caskets by bars. The coffins rise high above the lone man in an apparently endless architecture of death. Strange tricky spirits dance at the edges of his sight as he takes in his ghastly location. This is clearly an image of…I…uh…I have no idea…what the hell sort of nightmare fairy tale is this? How did Doré think of this stuff? 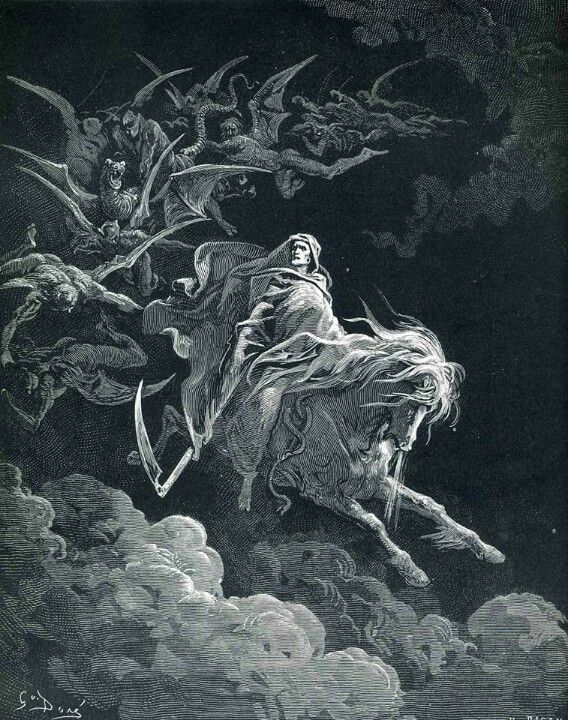 Here finally, from Revelations, the final book of the New Testament, is an image of Death himself leading forth the horsemen of the apocalypse and the dark angels. This disturbing posse is descending from the sky to harrow the world of all living things and usher in a static and eternal era of divine singularity (which is the upsetting and unexpected end to a book about a kindly young rabbi who teaches people to be compassionate). Look at Death’s proud cold mien, which alone is composed and immutable in a desperate jagged composition of moving wings, scrabbling claws, ragged clouds, and blades of every sort.